. . .Dorothy. "Betsy and Trot and I won't waste another minute." Well, the last one was not really an Oz Book at all and just adjusted to fit within the great scheme of things, this one is back to being about Oz through and through, yet it thankfully breaks the same old, same old formula. This is one of my favorite Oz books! I think it's because there's an actual mystery intertwined into the plot... Actually, multiple mysteries! MUCH better than the last couple of volumes! This one actually felt like a proper Oz book and it felt like it packed in more story than the last few put together. I actually thinks this is the quintessential Oz book. It features most of the characters you know and love from the series and a sharp narrative angle. We sped through it because my kids were really interested to hear what happened next. I think we finished the final third in one sitting. The best thing about this Oz book is that it has all the main characters adventuring together - the entire huge ensemble of them - as they search for Ozma. Ah, this is one of the most tantalizing installments in the Oz series. 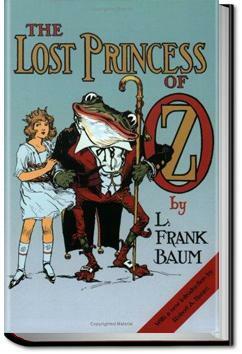 Not only does it feature perhaps the best title of all of L. Frank Baum's Oz books, it has one of the biggest casts of characters at work.